Go to original pattern for design DROPS 194-7. Knitted jacket in DROPS Air or DROPS Nepal. 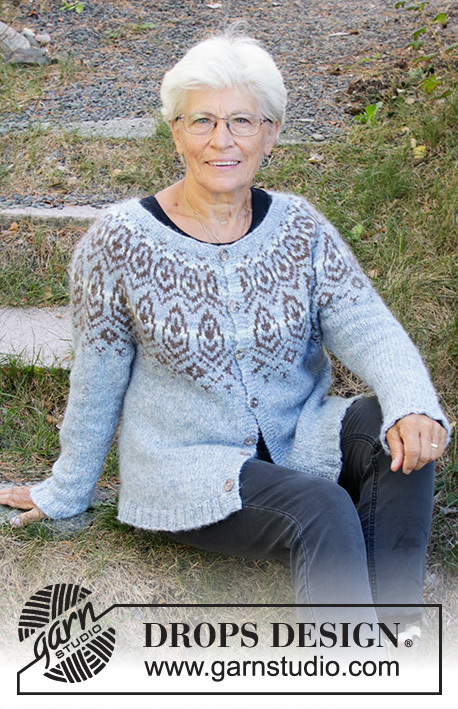 The piece is worked top down with Nordic pattern and round yoke. Sizes S - XXXL. DROPS CIRCULAR NEEDLE SIZE 5.5 MM: length 80 cm for stocking stitch. DROPS CIRCULAR NEEDLE SIZE 4.5 MM: length 80 cm for rib. DROPS MOTHER OF PEARL BUTTONS, Arched (white) NO 522: 7-7-7-8-8-8 items. 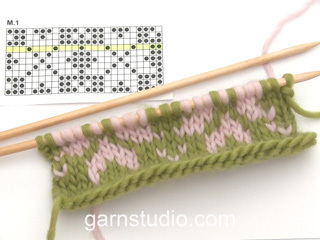 You can get the yarn to make this pattern from	41.40£. Read more. To work out how to increase evenly, count the total number of stitches on the needle (e.g. 84 stitches), minus the bands (e.g. 10 stitches) and divide the remaining stitches by the number of increases to be made (e.g. 11) = 6.7. In this example, increase by making 1 yarn over after approx. each 7th stitch. On the next row/round work the yarn overs twisted to avoid holes. Do not increase over the bands. See diagram A.1. Choose diagram for your size. 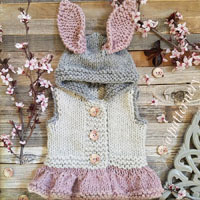 The whole pattern is worked in stocking stitch. NOTE: Work the bands with the background colour of the pattern stripe. Decrease 1 stitch on each side of the marker thread as follows: Work until there are 3 stitches left before the marker thread, knit 2 together, knit 2 (the marker thread sits in the middle of these 2 stitches), slip 1 stitch as if to knit, knit 1, pass the slipped stitch over the knitted stitch. Work buttonholes on the right band (when the garment is worn). Work from the right side when there are 3 stitches left on the row as follows: Make 1 yarn over, knit 2 together and knit the last stitch. On the next row knit the yarn over to leave a hole. The first buttonhole is worked when the rib in the neck measures approx. 1½-2 cm. Then work the next 6-6-6-7-7-7 buttonholes with approx. 8½-8½-9-8-8½-8½ cm between each one. The jacket is worked back and forth with circular needle from mid front and top down. 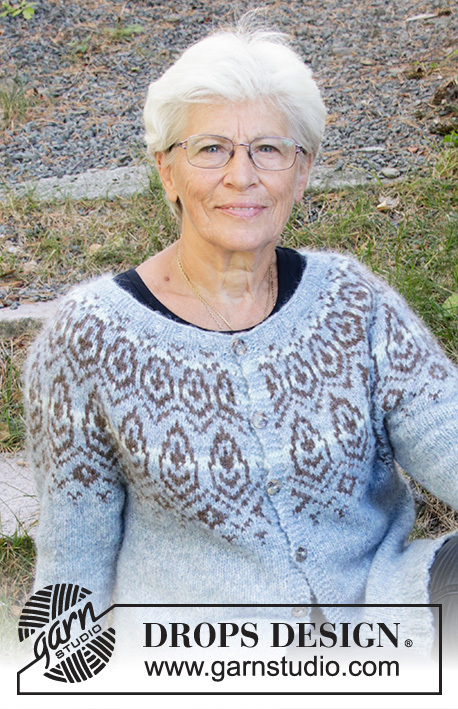 The sleeves are worked in the round with short circular needle/double pointed needles. 5 band stitches in GARTER STITCH – read description above, * knit 2, purl 2 *, work from *-* until there are 7 stitches left on the row, knit 2 and work 5 band stitches in garter stitch. Work rib like this for 2 cm. Remember BUTTONHOLES on right band – read description above. Then knit 1 row from the right side where you increase 11-15-19-19-7-7 stitches evenly on row – read INCREASE TIP = 95-103-111-115-103-111 stitches. Then work yoke as described below. Change to circular needle size 5.5 mm. 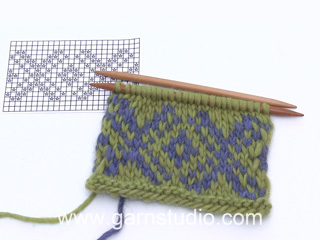 Now work PATTERN – read description above, as follows – from the right side: 5 band stitches in garter stitch, work A.1a until there are 6 stitches left on the row (= 21-23-25-26-23-25 repeats of 4 stitches), work A.1b (= 1 stitch) and finish with 5 band stitches in garter stitch. Continue the pattern like this and increase as shown in the diagram. REMEMBER THE KNITTING TENSION! 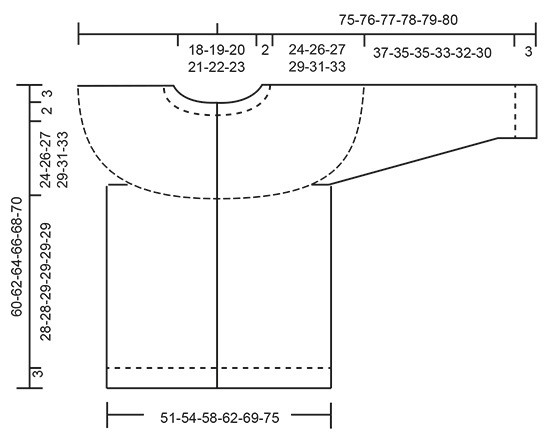 When A.1a and A.1b have been worked as far as the row marked for your size, there are 263-287-311-323-333-361 stitches on the needle and the piece measures approx. 26-28-29-31-33-35 cm measured mid front from the cast-on edge. You can continue with the diagram if necessary, without more increases, until you reach the right length (after the last row, continue with fog). 51-57-63-63-62-67 stitches on a thread (= sleeve), cast on 6-6-6-6-12-12 new stitches on the needle (= in side under sleeve), work as before over the next 75-81-87-93-99-109 stitches (= back piece), place the next 51-57-63-63-62-67 stitches on a thread (= sleeve), cast on 6-6-6-6-12-12 new stitches on the needle (= in side under sleeve), work the remaining 43-46-49-52-55-59 stitches (= front piece). Body and sleeves are finished separately. THE PIECE IS NOW MEASURED FROM HERE! = 173-185-197-209-233-251 stitches. 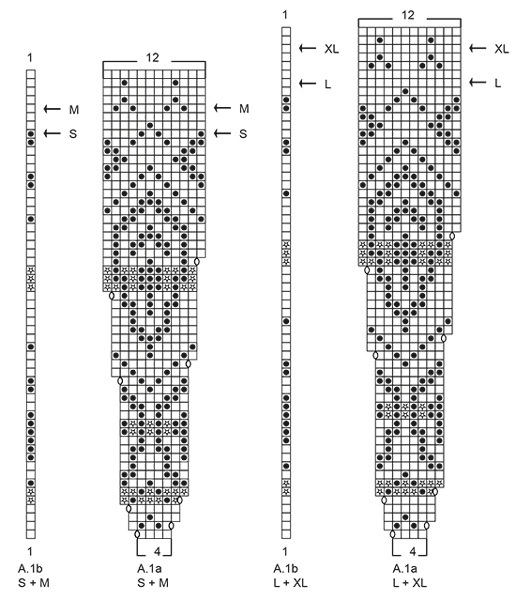 Work until the whole of diagrams A.1a/A.1b are finished in height, then continue with stocking stitch and fog; the band stitches in each side are worked as before. When the piece measures 28-28-29-29-29-29 cm from the division, purl 1 row from the wrong side where you increase 35-35-39-39-47-49 stitches evenly on row = 208-220-236-248-280-300 stitches. Change to circular needle size 4.5 mm and work the next row as follows – from the right side: 5 band stitches in garter stitch, * knit 2, purl 2 *, work from *-* until there are 7 stitches left on the row, knit 2 and work 5 band stitches in garter stitch. Work the rib like this for 3 cm. 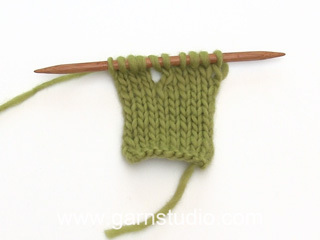 Cast off with knit over knit and purl over purl – to avoid the cast-off edge being tight, you can cast of with needle size 5.5 mm. The jacket measures approx. 60-62-64-66-68-70 cm from the shoulder. Place the 51-57-63-63-62-67 stitches from the thread on the one side of the piece on short circular needle/double pointed needles size 5.5 mm and knit up 1 stitch in each of the 6-6-6-6-12-12 stitches cast on under the sleeve = 57-63-69-69-74-79 stitches. Insert 1 marker thread in the middle of the 6-6-6-6-12-12 stitches under the sleeve and start the round here; allow the marker thread to follow your work onwards. If you still have rounds left to work in A.1 for your size, continue working until both A.1a and A.1b have been completed in height, then work with fog and stocking stitch. When the piece measures 2 cm from the division, decrease 2 stitches mid under sleeve - read DECREASE TIP. Decrease like this every 6th-5th-4th-4th-3rd-3rd round a total of 10-12-15-14-16-17 times = 37-39-39-41-42-45 stitches. Continue working until the piece measures 37-35-35-33-32-30 cm from the division (shorter measurements in larger sizes due to longer yoke). 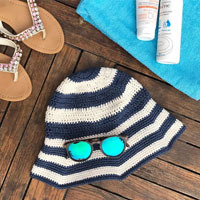 Knit 1 round where you increase 7-9-9-7-10-7 stitches evenly on round = 44-48-48-48-52-52 stitches. 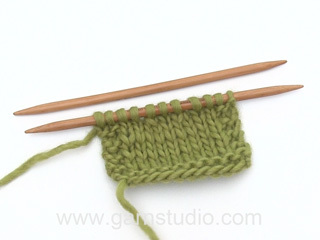 Change to double pointed needles size 4.5 mm and work rib (=knit 2/ purl 2) for 3 cm. Cast off with knit over knit and purl over purl - to avoid the cast-off edge being tight, you can cast off with a needle size 5.5 mm. The sleeve measures approx. 40-38-38-36-35-33 cm from the division. Work the other sleeve in the same way. Sew buttons onto the left band. Om man skal øke på retten og strikke frm og tilbake så stemmer ikke diagrammet, da skal det økes på 2 omganger etter hverandre. Hva er riktig? 2.část: .Poté jedu zpět zleva doprava (rubovou stranu),upletu prvních pět ok légy,poté dle vz. A1b, upletu pouze to jedno,tj. šesté oko obrace a dále pokračuji už jen podle vz.A1a a střídám vzor už jen dle tohoto rozpisu? 1.část: Svetr je nádherný,jsem ale začátečník při vyplétání norského vzoru.Sedlo: Začínám tedy od vz.A1a, zprava doleva,pletu hladce,po každém čtvrtém oku přidávám jedno oko a před šestým okem se řídím vz.A1b,tj. jedno oko upletu hladce (jsem na lícové straně) a posledních pět ok légy vroubkovým vzorem? Bonjour Caty, si vous souhaitez que l'encolure dos soit légèrement plus haute que celle des devants, vous pouvez tout à fait tricoter une réhausse - elle n'est pas prévue dans ce modèle, mais vous pouvez vous inspirer d'un modèle de même tension qui en propose une. Bon tricot! 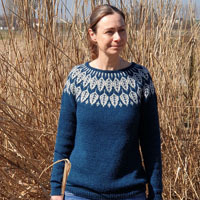 Hi Ingunn, Right at the bottom of the pattern you will find a diagram with all the sizes. Depending on your size, you will need 100g or 150 g of the colour for the pattern. Happy knitting!